Steve gets close to feed this croc. A wonderful tribute painting of Steve Irwin. You where a good man I hope you rest in peace. Steve I was young when you died but, I know you were a wonderful man and a very adventurous guy. You made a change happen in my heart that picture descrfibes you in so many ways! R.I.P steve I LOVE YOU!!!!! Crikey,he looks like a jungle king! And the lion his joker. Haha,nice artwork! RIP mate. It\'s a good picture, just one thing missing though, a crocodile!!! Wow, can\'t believe it\'s been almost 3 yrs. since his death. Right now, I am watching one of his episodes. Doesn\'t seem like he is gone. The painting is amanzing. It shows his love of animals, big and small, no matter how dangerous they were. He loved them no matter what. Steve, you were and are loved by all. We miss you!!! Wow! A beautiful tribute. I love it! I am a animal lover and fell in love with Croc Hunter tv show. I use to hold my breath when he would handle snakes!I remember like yesterday, when I heard the tragic news of his death. This picture reminds me of what a warrior Steve was for every animal, but especially crocs. Beautiful. Just like Steve's relationship with not only animals, but all the people who's lives he touched. Including mine. We miss you Steve. Steve is an amazing human being and he was admired by many people. Steve's family is in my thoughts and prayers. May Steve rest in peace. I always watched his show since very young at the age 8. He was, and still wil be my hero and someone who I admire the most. I want to become just like him, because I too have a great passion about wildlife. And I was a big fan, and I also bought the "Steve and Me" book. And it is a very good book so I recommend all of Steve's fans to buy one. Steve Irwin........The Watchman over all animals, mammals & reptiles large and small and a hero to us all. I loved his passion for nature and the way he had conquered fear of wild animals. I'll always miss him. I love this painting. I've always wanted to meet Steve, but now, I wont.... Its sad. Poor Terri, Bindi, Bob and Wes. And everyone. Realmente esa pintura expresa su devoci�n por el cuidado de los animales, grandes y chicos, fuertes y d�biles, el fue un gran hombre. Pueda ser que alguien contin�e su arduo trabajo como lo hizo el. Hasta siempre Steve!!! Fantastic painting of the legend that is Steve Irwin. Steve the guardian of all animals large and small...an elemental guardian of earth...strong in spirit and teacher of all things conservational.I miss you each and evryday. I don't think a day goes by that my heart doesn't ache for you and your family. This is the most beautiful and touching pictures I've ever seen. I'll miss you and your presence will always be felt. Forever in our hearts. This photo is my screensaver and I treasure this photo! One of the most beautiful tributes I've ever seen of my love, Steve Irwin. This a great pic of Steve Irwin because he was my # 1 hero and to see that he is dead that is so hard because i always thing that Steve Irwin will have a new show out and then i remember that he is not here anymore =-( and i thing that this painting of him is so beautiful who ever made this u did so will. Wow, thats an amazing painting! One of the best Tributes son far! 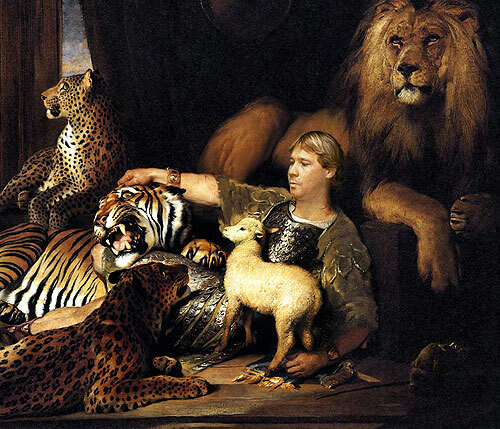 Sir Steve of Irwin, God of the Wild Things, Protector of all animals large or small. That's what I would call this wonderful painting. Steve, it's almost been a year, but you are still loved & missed by so many. Steve Irwin would of loved this picture, it fits perfectly for Steve Irwin the legend loved by everyone and everything. WE LOVE YOU STEVE !!!!!!!!!!!!!!!!!!!!!!!!! Beautiful Painting!!! It's missing his favorite animals the Crocs. but still beautiful. WE MISS YOU STEVE OH SO MUCH!!! This is what Steve lives for and he has fulfilled his mission. This is a great symbol for Steve as he is the first and greatest conservationist i will ever know. Steve was my hero.Me and my cousin Ryan loved him so much we do anything to keep him alive. I will really miss you and your cool shows. This is the most beautiful picture I have seen in a long time. It reminds me of what heaven must be like, as it was in the begining of mankind. It is breath taking. Steve was my hero,and I will miss him, and I thank him for all he did for God's creatures. steve was a great man i watch his shows all the time i miss him so much cry cry cry!!!!!!!!!!!!!!!! I think that this is a good tribute to steve and I love steve. I learned from steve since I was 4 now I am 10.I loved him. The picture is quite beautiful.It brings tesrs to my eyes.Steve will never be fogotten in the eyes of all his fan and I will tell his story to my children and granchildren. Rock on my Hero. not only is he welcoming the animals they are coming to him. Wow. Whoever did this is not only unbelievably talented, but they captured the true spirit of Steve. He looks perfectly at peace surrounded by the passion that filled his life. What a stunningly beautiful tribute to a beautiful man. this is beautifull its jsut the way it should be love it! That is amazing! I can hardly believe it! I love it! RIP STEVE! This is so awesome! Steve's detail, and the animal's, is AMAZING! That's where he is now, resting with his one true passion...ANIMALS! Great tribute picture to a great man! I can hardly tear my eyes away from the picture to write this comment. Not only is the visual detail astounding, but it's just such a beautifully fitting representation.